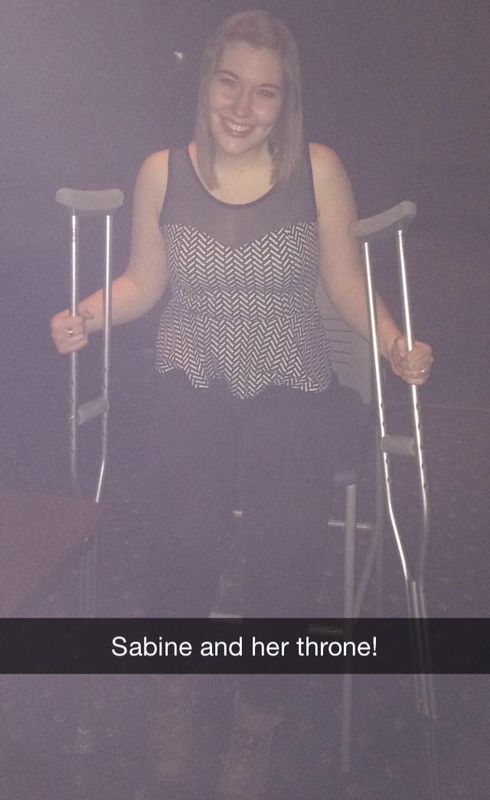 I recently spent two weeks on crutches after falling and badly bruising my femur. I’m in less pain now, but stairs are still difficult and I can’t bend my knee enough to sit in the back seat of a car. I’ll admit that I spent a lot of the first few days on crutches being frustrated at my weak upper body, feeling sorry for myself as I trudged through snow, and grumbling about the inaccessibility of my campus. But then I started paying attention to how my injury brought out compassion in people. Dining hall workers offered to carry my plate. Concert staff tracked down a tall chair for me. My supervisors at work modified my jobs and took over where I couldn’t complete tasks. My orthopedist told me he was impressed at my maturity. My dad consulted me about how to handle the insurance complications. Classmates checked in on my progress every day. One student told me to never hesitate to ask for help. Others held heavy doors for an extra thirty seconds when they saw me approaching. One waited for five minutes with the door in hand as I put on my coat and gloves. But my friends were the real compassion superstars: driving me to urgent care and doctor’s appointments, carrying dishes at dinner, matching my (extremely slow) pace around campus despite the cold. Since I’ve gotten off the crutches, people don’t hold doors. They don’t ask how I am. They let me fall behind. The compassion of strangers seemed to stop just as suddenly as it started. It’s much easier to go about your day completely unaware of other people, but that doesn’t mean it’s better. That’s what #1000Speak is all about: a reminder to show kindness and gratitude to those around us. We don’t always know what’s happening in their lives–injury, distress, loneliness–but we can always afford to show a bit of compassion. I think it’s that people just don’t think about it when you display no visible sign of injury. To me, it’s just common courtesy to hold a door open for somebody coming in behind you rather than to let it shut in their face. Definitely. I’m still wearing a knee brace, so I have a visible sign of injury, but without the crutches it’s significantly less obvious. Admittedly I also did need people to hold the door for me then and I don’t now, so I don’t mind. It’s just interesting how I got used to people going out of their way slightly for me and now I notice how people don’t. It’s not a PROBLEM, per se, but doing little things for people is a good habit to get into. And yes you are right. People walk around all the time, just doing their normal thing and being in pain the whole time. It is important to be aware of the people around you and be kind to them. And extra-kind when you notice someone you see around all the time looks normal, but is moving a little more slowly than usual, or else is walking around lost in thought. Good post. Very, very good. I know what you mean. Compassion is a gift we can give to everyone around us. We shouldn’t wait until they have an injury. Just reach out in love. I’m glad you’re off the crutches! So, how are you today? I know people are usually caught up in their lives, looking in instead of out, but it still surprises me at how little we do pay attention to those around us. I often try to pause as I’m going through a door to see if someone is around. I try to hold it even if they aren’t limping, but if I notice someone struggling or going particularly slow I’ll wait. How much can I miss in those few seconds? Even added together it’s such a very small slice out of life to show that tiny bit of kindness. Exactly, I’m definitely glad you see that perspective, Trent. As for how I am–I developed a pretty nasty case of bronchitis, but I’m doing a lot better today. You’re not having a good year, are you? Hope you feel better! I think so too. I think people aim to be compassionate, but sometimes life distracts us from doing so. That’s very perceptive of you and you’re right! We don’t pay much attention to people who don’t show visible signs of needing help. Which could be completely misleading! Many people do have internal struggles but we need to be aware and show them compassion too! Exactly! Most of the struggles that people have are either internal or aren’t obviously external. For instance, I still take the stairs slowly because I’m in pain, but I don’t have a brace or anything that signals to others why I might take longer. Reblogged this on Do you like challenges? then….